We stayed a week at a full-hookup site. It was a back-in with a great view of the lake. Since we take our boat, we were able to tie the boat close to the campsite. The campsites are very roomy. The only negative was the grass burs. Our dog was not able to walk anywhere on the grass so had to only walk on the road. Lots of deer roaming the park. It was a very relaxing week for those who like to fish and read. 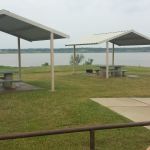 We camped at Copperas Creek COE in a Fifth Wheel. Great Campground with some elbow room around sites. Friendly Gate Keepers and Rangers now. Park has been renovated within the last couple of years. Full working restrooms and showers. Cleaning staff seems to keep it up nicely. Mowing was done only around camp sites at this time we were told due to the beautiful wildflowers being in full bloom. Staff told us after the next few weeks, they implement a full mow back to water and woods edge for the rest of the season. Most sites are easy back in spots. There are only 20 Full Hookup sites out of 66. The rest are water and electric only. Dump station is located in between the two camp areas. Only $4 for travelers not staying in Park. Only a couple of drive thru spots. However, most all of the sites we saw could handle large RV's. Ours is 40ft. 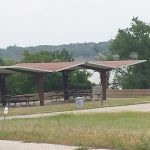 There are 2 Boat ramps, 2 courtesy boat docks and 2 fishing docks. This is an Army Corp Park and not an RV Resort so as stated by a previous reviewer there are no extra frills. Just swimming (No Lifeguards), camping, fishing and boating. Rangers insist on lifejackets. 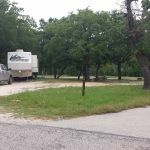 They also have several double sites and two large group shelters sites for large camping groups of 8 RV's or 14 RV's in the same area. Singles cost from $16-$26, doubles cost $28-$42 & Group Shelters are $100 & $130. An enjoyable Memorial Day week. 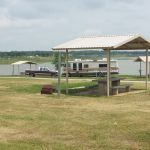 We camped at Copperas Creek COE in a Fifth Wheel. Wonderful park, we stayed for 14 days and caught a lot of fish. We camped at Copperas Creek COE in a Fifth Wheel. Our family has rented multiple sites at this park for the past three years for a family reunion. Each year the female gate guard has been rude and unfriendly to each one of our families as they have checked in or asked her questions. I actually dread driving through the check point! We have been respectful of all park rules and regulations. Also, each year the park has needed mowing and all sites have been covered with grass burrs or stickers. It took us a month to get them out of our carpet. Although the waterfront sites are nice, we will never stay in this park again due to the unfriendly gate guard and grass burrs. We camped at Copperas Creek COE in a Fifth Wheel.